Lets face it, if you had the chance to see some wild Pine Martens, you’d be more than happy to get up at 530am and drive for two hours along Yellowstone’s frozen valleys in sub zero temperatures to a location that has, in the past, been used by the BBC Planet Earth team, to photograph them! During my Yellowstone trip, we had the great privilege of being able to do just that and spend time on some private property which is regularly visited by a local Pine Marten family. Given that these mammals are usually very shy and difficult to find, it was certainly one of the highlights of the trip and our time spent with them was both rewarding and frustrating. Rewarding because, well, we were able to photograph wild Pine Marten and frustrating because, like any wildlife, just because it’s in the area it does not guarantee you sightings and you still have to put time in to get the images. Our location for the Pine Martens was the log cabin of Photographer Dan Hartman and his wife Cindy, who are both incredibly nice people that have made it their life’s work to document and educate people about the wildlife Yellowstone has to offer. Their land has had Pine Marten visitors for many years now and rather than keep it all to their selves, they very kindly open up part of their home (and lives!) to those that wish to come and hopefully see and be educated about these wonderful creatures. At the time of our visit, they did not advertise out to photographers, although on rare occasion they would allow them to photograph there. So initially I was not going to mention the location. However, before I published this write up, I emailed them to ask how they would like me to approach giving out (or not giving out) information about the site to respect their wishes, and they informed me that whilst they are more than happy for the site to be promoted, they also asked me to point out they no longer allow people to photograph from their property at all, as it has become too intrusive – a point you can fully appreciate when I tell you that one of the hides we were shooting from was in fact their bedroom! When you take that into account, it was incredibly generous that they ever allowed anyone to photograph there, and that makes me appreciate my time with them all the more. I really can’t thank Dan and Cindy enough, not only for their hospitality in letting four photographers and their assorted telephotos and tripods move about in their home, but also for their friendly and informative conversation – oh, and the coffee and freshly home made cookies too! We arrived just before 8am and were met by Dan who was coming down the path to greet us, or so we thought. Actually his first words were along the lines of ‘forget setting up the tripods, they’re out, you need to be quick’. We hurried ourselves in to our makeshift hides, one of which was Dans photo gallery (where is displays and sells many of his own incredible work) and the other was his bedroom. and sure enough, there it was, a Pine Marten eagerly checking out the bird feeders to see if there was a meal to be had. I’m not sure what surprised me more, the fact I was seeing a wild Pine Marten, the fact it was so much bigger than I had imagined or the fact it was so close I only had to use my 70-200! We had several minutes during our first encounter but the sun had barely risen let alone broken over the mountain that we were in the shadow of, and so those shots served as ‘look, I’ve seen a Pine Marten’ images and nothing more. 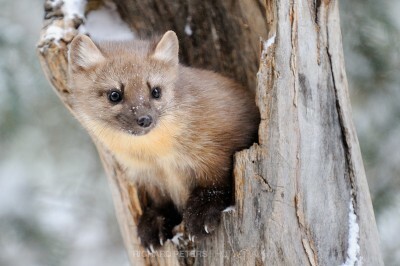 At the time of our visit however, Dan had seen up to seven Martens at once, and so our spirits and optimism were high. After all, if this was good enough for Planet Earth, it was certainly good enough for us! And so, with that knowledge in mind and the assurance of Dan that some of them should come back at some point we sat and waited. And waited. An hour later, we had another showing which lasted 3 brief minutes. During the hours of no Marten activity we were occupied by both the many birds that would visit the feeders as well as some great conversation with Dan, who had some excellent little stories to share about his time spent with BBC film crews. He also showed us the section of Planet Earth that was filmed on his property. I remembered the Pine Marten sequence from watching it back at home but it was great to see again, especially whilst at that very location! Our third sighting was an hour later and this time, the first Marten was joined by a second, which from memory at the time I believe was his brother. It was this visit where we really got to appreciate not only how social these animals are, and watching them chase each other as they run about climbing through the trees together was a wonderful sight, but also how agile! We watched on several occasions as they would jump between two feeders that must have been a good 3 or 4 feet apart easily. The Martens especially like to play about in the logs and on the old tree stumps, not least I expect because they know with the latter, there is the potential for a tasty treat! Needless to say, the birds look non too impressed when the Martens arrive and start to climb all over their feeders! It was great fun snapping them as they climbed the trees and stuck their heads out the holes in some of the tree stumps. They tend to move around quite a bit so it wasn’t always easy getting them still enough for a sharp image, especially as the light on that day was very cloudy and added to that we were in the shade of trees, so the shutter speed v ISO battle raged all day long! Unfortunately, all my images with the two in are quite soft as I couldn’t keep the shutter speed high enough to freeze them as they interacted. Twelve minutes later, and just as quickly as they arrived, they were gone again and it would be three hours until we would get another visit, this time giving us the longest views of the day with 18 minutes of Pine Marten shenanigans. We had actually packed up for the day as it was late in the afternoon and the light was basically gone. But then as we stood chatting about the days events, we spotted movement, and sure enough we had a last few minutes with these wonderful creatures. It was actually this final visit in which I took one of my favourite images, as one of the Martens came right up alongside the cabin and vanished into a dark corner. I leaned round the window and managed just a couple of brief frames as he emerged from underneath the cabin. This final visit lasted 10 minutes and they spent much of that time in the trees, were the light was completely gone and the high ISOs were really put to the test. Then, just like before, as quickly as they arrived they were gone again and with a final flick of a tail it ran over a snow bank, the sun was gone, the Pine Marten was gone and our time there was over. It was a superb end to the day, and being one of our final days of the trip a great way to end the whole Yellowstone visit. We never did see more than two of the Martens, and most of the time it was just a single visitor. Dan explained it was a quieter day than usual for them and the previous day they had visited many more times (which was typical, as that summed up most of the Wildlife viewings of the whole trip away) but we didn’t mind. We got to view and photograph a species that is rarely spotted for more than a fleeting moment. I worked it out roughly that we were there from 8am till 5pm and we had about 50 minutes worth of activity. During those windows of activity time they would vanish for up to several minutes at a time, either in the trees or round the back out of sight, then re-appear. So out of our total time of 9 hours on site we had probably nearer half an hour to maybe 35 minutes of actual viewing time – but what an amazing and unforgettable 35 minutes that was! I’d like to pass on my thanks one last time to Dan and Cindy for allowing us to use their home and gallery to shoot from. And don’t forget, even though they no longer allow photographers to bring cameras on site they still openly welcome observers. I highly recommend a visit to them so that you can hopefully watch and learn about these fantastic animals for yourself.